Did they deserve to go? On Sunday the Steelers secured their fate of not going to the playoffs for the first time since Bill Cowher became coach of the team. The true fact, if we can face it is this team didn't really deserve to go to the playoffs. Starting at the beginning of the year they got some wins but they got these by barely beating week opponents. Down the stretch they have played pitifully, barely being able to score points. They have also lost the games that have counted the most. They lost twice to the division rival Oilers. These games proved to be costly as the Steelers competed with the Oilers for a playoff spot in the final weeks of the season. They also lost against the New England Patriots near the end of the season. This was also a team they were competing with to reach the playoffs. Last but not least, the loses to the Bengals. Two of this poor team's three wins this season came against the Steelers. And these Steelers were supposed to be an elite team? Again the element of not winning the big games comes into play. The final game could have been a must to get into the playoffs. The Patriots win eliminated the Steelers but that game was down to the wire and the Steelers knew all afternoon that if the Pats lost they could still have a playoff chance but once again they didn't take care of business. One also can't say that this team didn't have times of good play that might make a fan think the future is bright. Or at least not feel so bad about this year. The team beat the Packers and Jaguars at home and could easily have won an extra four games. They got beat at Tennessee by a last second field goal in a game that would have been easily won without the abscence of their place kicker. 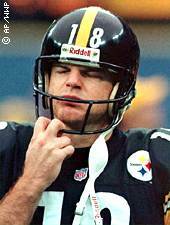 Cowher went for several fourth downs that he at other times would have kicked. Let's not even go into the coin toss game. The two Bengals games could also have been won. The last one was only lost by a field goal and the first one was ruined by Neil O'Donnel (give us a break Neil, it's starting to get old). Another after effect of not making the playoffs was that Bill Cowher will remain tied with Paul Brown as the NFL rookie coaches with the most playoff appearances to start a season. Bill Cowher is a great coach that deserves a lot (though sharing a record with Paul Brown isn't that bad). For this year, Steelers fans will unfortunatly have to coin the phrase "Wait till next year."